Disease management is good for health insurers and big pharma. Disease creates more profits than preventive care. Health care of this sort is not good for us. Western longevity may have been extended, but at what cost to quality of life? We can see this problem in the news about how EpiPen (the allergy treatment injector) prices have climbed nearly 550% over the last eight years. Despite complaints from government and consumers, the drug maker is not lowering the list price. There is little competition so it is unlikely to do so. The drug company is promising to increase insurance out-of-pocket assistance up to $300, from $100 and expand the number of low-income patients eligible to receive company subsidies. They even created their own generic pen to compete against themselves. This simply shifts the cost to higher insurance premiums and brings to light the plight to the middle class Americans. Rising out-of-pocket health care costs for middle class Americans is putting a serious dent in lifestyle. Overall, health-care spending across the economy has increased 38 percent since 2000 but this figure hides how the middle class have been hit hardest. The government pays more into Medicare, and Medicaid and provides subsidies for low-income people. Middle-class households who are not retired are deemed poor and are finding more of their health-care costs are coming out of their own pockets. Middle-income households now spend the largest percentage (8.9%) on health care (i.e. disease management). This is a 25% increase over their health care spending in 2007. The easiest solution to this problem is to return to nurturing natural health instead of investing in disease management. You can earn numerous ways to enhance our natural wealth with our shamanic health reports. See details here. Here is why I am excited about the essential oil deodorant Merri and I use. Merri and I lived and worked with this Ecuador Yatchak for seven years. 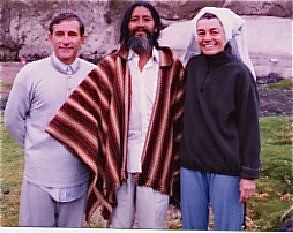 This photo was taken after a purification ceremony at a sacred spring. One of the main ways this shaman helped restore our health was through purification. He had us walk in mountain mists. “The negative ions in the mists attach to free radicals and purify the skin to cleanse us from the inside out,” he said. Another purification was of our blood. He fed us herbs, minerals and a low calcium diet. There was almost no dairy served. We used watermelons, pineapple and sweats to purify. Everyday living bombards most of us with all types of toxicity, from the air we breath, to the water we drink, even the receipts at the supermarket may be toxic. Merri and I compensate for this by taking care in what we eat, drink and especially breathe and put on our skin. The fastest way for any element good or bad to get into the blood stream is via the lungs and the skin. Now there is a better way to replace a toxin with a purifier. Since it is difficult for most of us to avoid toxicity in the West, this message looks at a longevity alternative and begins by showing how in the early 2000s, due to strict FDA regulations, the government has approved a product that may encourage cancer, create dementia, Alzheimer’s and complicate kidney problems. The FDA issued a final rule which said “over-the-counter (OTC) antiperspirant drug products are generally recognized as safe and effective and not misbranded as part of FDA’s ongoing review of OTC drug products”. I suspect that part of this ruling was influenced by scientists with the Personal Care Products Council, the trade association that represents the cosmetic and personal care products industry. They have claimed that “antiperspirants can be used with high confidence of their safety. They’ve been used for many years, and there’s no evidence that suggests a problem“. The FDA’s claims of safety are not entirely correct, because antiperspirants contain aluminum. In other words there’s no definitive answer. There are links between aluminum and disease, yes. There is a link to Alzheimer’s, dementia, diminished thinking and cancer but, no study provides specific proof of a direct link between antiperspirants and these problems. This agency’s report on aluminum says: Workers who breathe large amounts of aluminum dusts can have lung problems, such as coughing or changes that show up in chest X-rays. Some workers who breathe aluminum-containing dusts or aluminum fumes have decreased performance in some tests that measure functions of the nervous system. Some people who have kidney disease store a lot of aluminum in their bodies. Sometimes, these people developed bone or brain diseases that doctors think were caused by the excess aluminum. Although aluminum-containing over the counter oral products are considered safe in healthy individuals at recommended doses, some adverse effects have been observed following long-term use in some individuals. Studies in animals show that the nervous system is a sensitive target of aluminum toxicity. Then there is the question of parabens. A health warning from Mercola.com (4) says: 99% of Breast Cancer Tissue Contained This Everyday Chemical (NOT Aluminum). Recent research found higher concentrations of parabens in the upper quadrants of the breast and axillary area, where antiperspirants are usually applied, suggesting they may contribute to the development of breast cancer. The data from this latest study, the most extensive examination of parabens in human breast so far published, confirms previous work and raises a number of questions on the entire parabens, personal care product and human health debate, particularly relating to the source and toxicological significance of the paraben esters. We mix tea tree with other essential oils in a base of organic jojoba oil and use this under our arms instead. This essential oil formula acts like a deodorant and helps improve rather than decrease natural health. Let me begin by saying that essential oils have not been evaluated by the FDA as cures for any specific illness. This product is not intended to diagnose, cure or prevent disease. It simply a common sense approach to assume that putting organic, all natural essential oils under your arms is better for you then chemical laden deodorants and antiperspirants. Lavender (Lavandula augustifolia) – antiseptic, antimicrobial, deodorant, anti-inflammatory. This #1 Balancing Oil for the central nervous system is highly antiseptic. Great for balancing skin bacteria and combating odors. Lemon (Citrus limonene) – antimicrobial, antiseptic, astringent, antibacterial, tonic. The Oil of Sunshine to cleanse our skin, lift our spirits, and combat negative smells. Lemon is an exceptional antiseptic with a joyful aroma. Geranium (Pelargonium roseum) – deodorant, fungicidal, antiseptic, antibacterial. The Soothing Oil for calming down skin irritations and our nervous system. The rose element in this Geranium is nurturing to our physical and emotional state … our whole sense of well-being. Myrrh (Commiphora myrrha) – anti-inflammatory, antimicrobial, antiseptic, astringent, anti-fungal. An Oil of Antiquity renown for skin and wound care. Used in healing unguents of Ancient Egypt. Also known to instill tranquility and peaceful effects on many levels. Use a purifier rather than a toxin and save at the same time. You save first because you can also throw away expensive colognes, perfumes and face cremes as well as deodorants. You save money as you gain a chance for better health. Only one or two drops of each oil are required so a bottle goes a long way. One bottle lasts for a couple of months for me. If you use it for the face as well… obviously it will go faster. The price is already low, but during the sale the price is less than half that charged for 3 ounces of women’s DERMAdoctor Total NonScents Brightening Antiperspirant. More importantly this could offer a lifesaving savings. According to answers.yahoo, the treatment cost for stage 3 non-hodgkin’s lymphoma can easily exceed $300,000 so cutting off potential health problems at the pass can really make sense. Merri and I love the refreshing smell and feel of this spray that eliminates the need for perfume, cologne and antiperspirants that may contain unhealthy chemicals. We cleanse internally as well as explained below. Vitality Force provides a simple (and incredibly low cost) amino acid that can help improve cardiovascular systems, increase memory, improve vision, enhance vitality, expand energy and extend lifespan. A delegate at one of our courses was a doctor in his eighties but who had the energy and looks of a much, much younger man. When asked about his secret of youth he said his vitality was based on several factors. A few of them you would expect, such as good diet, sufficient exercise and plenty of activity in a strong, purposeful life. Then he explained another secret of his youth and energy: chelation. This youthful doctor told us he had been running the largest I.V. chelation center in the United States from Hawaii. Hardening of the arteries is such a huge problem in our modern world that he was making a fortune. Then, he said, he had learned about a vitamin-mineral formula that was so effective that he shut down his clinics and exclusively used this simple formula which he felt had better results than I.V. chelation therapy. Years of research are behind this comprehensive cardiovascular nutritional supplement, designed to maintain and promote vascular health, mental and physical well being. That client and doctor friend gave us a month’s supply of this formula. He thought it would be excellent for us and would help us with traveling also. Merri and I tried this product ourselves and felt better and better. We have made it a point to take heart healthy supplements since. We love the savings we enjoy with the mixed supplement we use. It is so much less expensive than all the numerous other vitamins and minerals that we had been taking. We actually were spending less! The system we use is so convenient. Everything is in one simple scoop of powder we take daily. Especially when we travel we just bring along a packet for each day we are on the road. No more loading up pill boxes or bringing bottles (or suitcases full of bottles) of vitamins and stuff. As is so often the case when we like something we start talking about it and pretty soon, a batch of friends were taking Vitality Force and telling us great things about their experiences. They reordered so much of it through that I decided to make it available to all my readers. Let me begin by saying that Vitality Force has not been evaluated by the FDA. This product is not intended to diagnose, cure or prevent disease and should only be taken as a food supplement. Having said this, I share information about Vitality Force below. This supplement combines over two dozen ingredients, known to have beneficial effects, into one total cardiovascular support program. 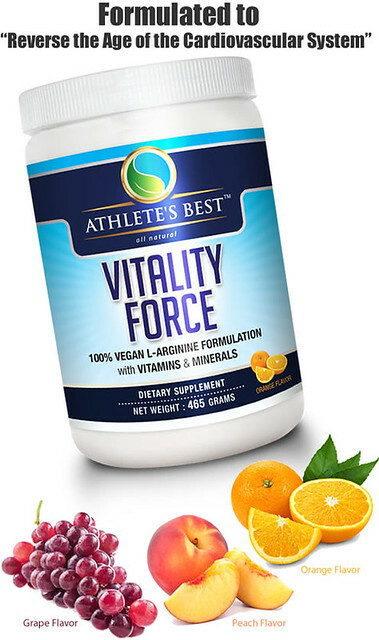 Vitality Force’s main ingredient is L-arginine. Studies have shown that L-arginine is a precursor to nitric oxide, an important cardiovascular signaling molecule. L-Arginine is the biological precursor of nitric oxide. The medical establishment has known about the benefits of nitric oxide as nitroglycerine and amyl nitrite which creates a flood of nitric oxide have been used in medicine for over a century. Nitric oxide is an important signal and effector molecule made by the blood vessels’ lining. The endothelium is exquisitely sensitive to the physical and chemical conditions inside our blood vessels. When the endothelium senses heart-healthy conditions, such as physical activity and low cholesterol, it releases more nitric oxide. That’s good because nitric oxide expands the blood vessels, increasing blood flow and decreasing plaque growth and blood clotting. In 1998, three research scientists won the Nobel Prize in medicine when they discovered the natural nitric oxide cycle in our cells. Nitric oxide is essential to a vital natural cycle at the cellular level. It is so important in neuroscience, physiology, and immunology, that one year it was named “Molecule of the Year”. Research into its function led to a Nobel Prize for discovering its importance as a cardiovascular signalling molecule. The nitric oxide cycle especially helps the heart. Nitric oxide is the simple molecule that improves the flow of blood to the heart body and brain, It also increases energy and stamina, relieve stress, strengthens the immune and digestive system, plus improves clarity of mind. Nitric oxide improves the health of the inner wall of a blood vessel, keeps vessels pliable and elastic, dilates blood vessels keeping blood flowing smoothly, relax blood vessels, keep platelets and white blood cells calm and prevent them from sticking to the vessel wall, prevent oxidation, slow plaque growth, suppress atherosclerosis and melt away plaque that already exists. Anti-Aging, Longevity, and Preventative Medicine are the Future! With our knowledge of alternative medicine doubling every three years and our technology advancing exponentially, we are entering an age where we are able to probably turn our biological clock backwards! Instruments are now in use that can measure the functioning of each of our physical organs and new high potency nutritional supplements, hormonal balancing, and advanced oral chelation products have become available which can enhance the functioning of our organs and help prevent heart attacks and fight many of the auto-immune and degenerative diseases that are plaguing modern society. There is one more benefit. That is the savings and convenience. Vitality Force is much more than just an all natural solution for cardiovascular health. The formula includes the highest quality arginine, vitamins, minerals, and other immune boosting ingredients. It works by dilating the blood vessels to allow more oxygen and nutrients to flow freely throughout the body. This helps improve the bio-availability of all nutrients and helps enhance your other supplements that you may already be taking. I like the powdered form because research suggests that consuming liquid nutritional products provides significantly improved absorption, (80% vs. 20% from tablets). I get all these ingredients in Vitality Force from one daily scoop of powder! I take mine first thing each morning and can feel a big positive difference in my vitality. Taking Vitality Force provides almost every vitamin and mineral that we were previously taking in separate form. Merri and I have actually reduced our spending on vitamins and minerals. The powder is tasty, easy to use and one container has a month’s supply, which at $44.95 makes this a very inexpensive way to get most of the vitamins and minerals you already take as you gain the chelation benefits. Vitality begins with activity including physical activity. Many factors in modern living inhibit our physical activity. There is a lot of stress to maintain a lifestyle. Modern conveniences like the computer, electricity and car make it easier not to exercise. There is also a difficulty in obtaining vitamin filled and rich, healthy food. All of this saps vitality and can lead to a negative health spiral. We feel badly so we eat comfort food and sit. This makes us feel worse and the negative spiral deepens. One way to break bad habits and a negative health spiral is to generate more nitric oxide. One way to generate more nitric oxide is simply by taking a scoop of Vitality Force each day! Learn more or order the food supplement Vitality Force. The price is $44.95 when you order one container. I recommend ordering two. The price drops to $37.95 and two months’ supply will give your vitality kick start a better chance. (3) The Agency for Toxic Substances & Disease Registry.